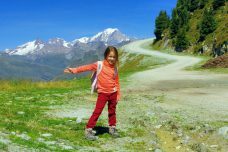 Are you looking for a Summer destination for all the family in the French Alps? 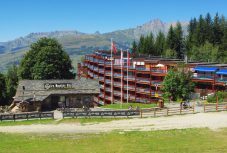 The resort of Les Arcs should please you. 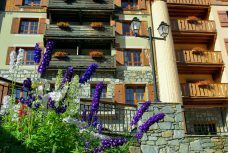 One of the world-class ski domain, Les Arcs welcomes you in Summer with breathtaking views of the surrounding peaks and the Mont Blanc. 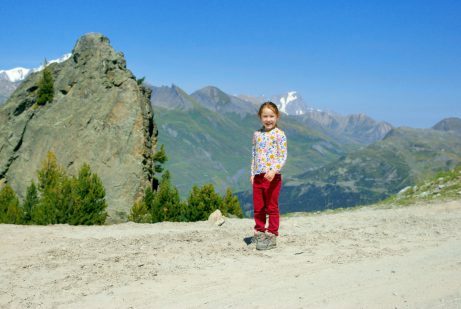 We’ve spent some holiday time in Les Arcs and here are a few reasons why we really liked it! 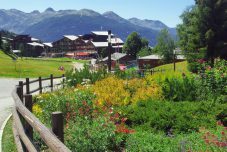 The ski resort of Les Arcs, a Summer destination! A winter wonderland. A paradise for skiers! 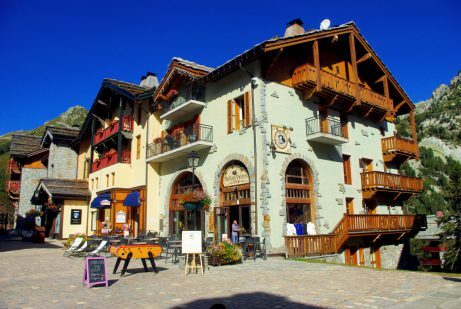 Les Arcs ranks amongst the most prestigious ski resorts in the world. At first the modernist architecture of Les Arcs can seem a bit disconcerting. But after spending some time in the resort, it’ll grow on you! The buildings of Arc 1600, Arc 1800, and Arc 2000 have been designed and built by French architect and designer Charlotte Perriand (1903-1999). The resort’s iconic “avant-garde” architecture has been labelled as “heritage of the 20th century”. 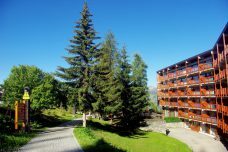 Only one resort has been built in a more traditional design reminiscent of the Alps: Arc 1950. 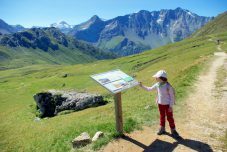 Accessible from Bourg-Saint-Maurice by the road or via the funicular. 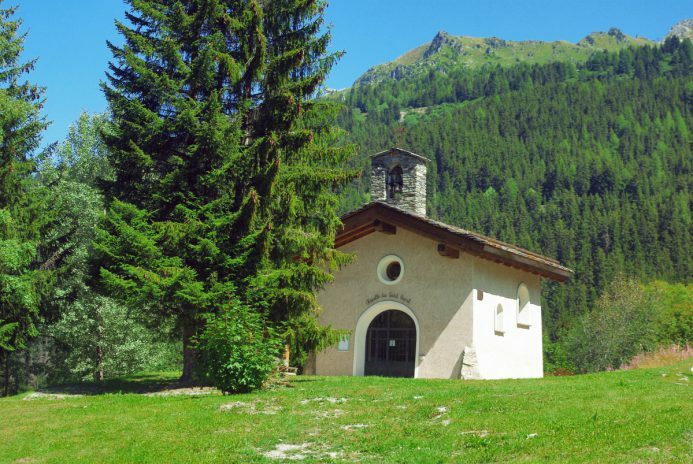 On the edge of the forest, it dominates the Middle Tarentaise. The latest addition (2003) to the domain with beautiful and exclusive 5 stars holiday residences. Built in 1979, its daring architecture contrasts sharply with the natural environment. 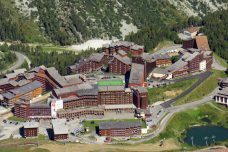 Les Arcs is part of the gigantic Paradiski ski domain, one of the largest in the world. The world-class ski-area offers uninterrupted skiing from Arc 200 to Montalbert. It totals more than 425km of ski runs between 1,200 and 3,250m! 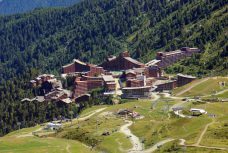 The resort of Les Arcs-Peisey-Vallandry is linked to the Grande Plagne domain via the Vanoise Express cable car. At its inauguration in 2004 the cable car was the largest aerial lift of its kind ever built. 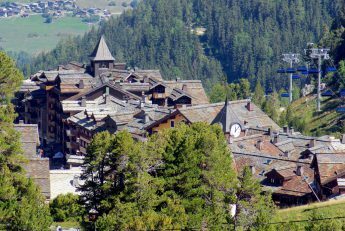 Between Peisey-Vallandry and Les Coches, the cable car spans 380m over the deep Ponthurin valley. 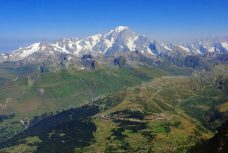 The Vanoise Express is made up of 2 double-decker cabins. They can take 200 people with a capacity of 2,000 per hour. 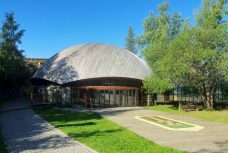 It is open during the Summer season. 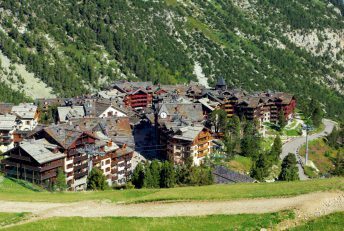 The little town in the Tarentaise Valley gives access to the three main mountain passes of Savoie: Cormet de Roselend, Little St-Bernard and Iseran. 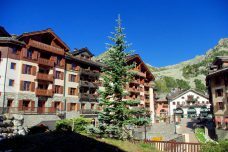 Access in Summer is by the road from Bourg-Saint-Maurice but also via Les Arcs’ Express. 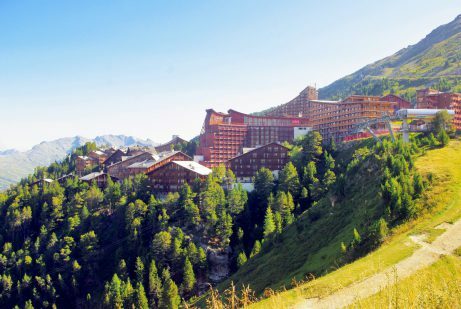 The funicular climbs 818m between Bourg-Saint-Maurice and Arc 1600 in 7 minutes. Free inter-resort shuttle buses operate throughout the Summer. They connect Arc 1600 to Arc 1800 and Arc 1600 to Arc 1950 and Arc 2000. 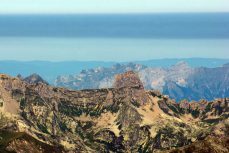 Mountain biking (VTT) is becoming year after year a popular activity thanks to the opening of ski-lifts in July and August. 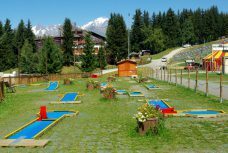 The Arc 1800 resort even has its own golf course with stunning views over the Middle Tarentaise, the Beaufortain mountains and the Mont Blanc. 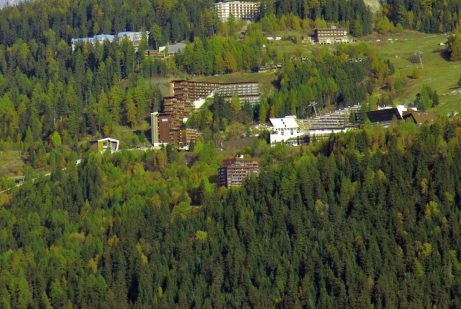 You can have an overall view of the course from the Transarc Télécabine. 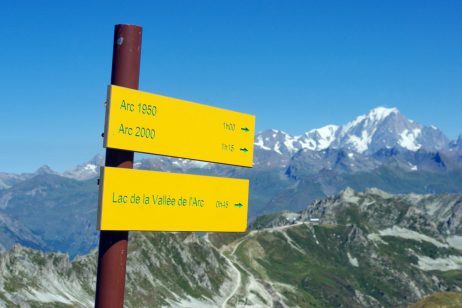 The mountain pass (2,457m) can be reached either from Arc 2000 (Arcabulle chairlift) or Arc 1800 (Transarc télécabine). 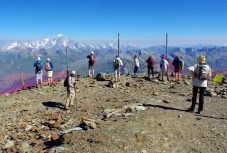 The pass offers great views of the Mont Blanc and the Vanoise peaks (Grande Casse, Grande Motte, Sommet de Bellecôte). There is a signed discovery path interspersed with information panels along the way. 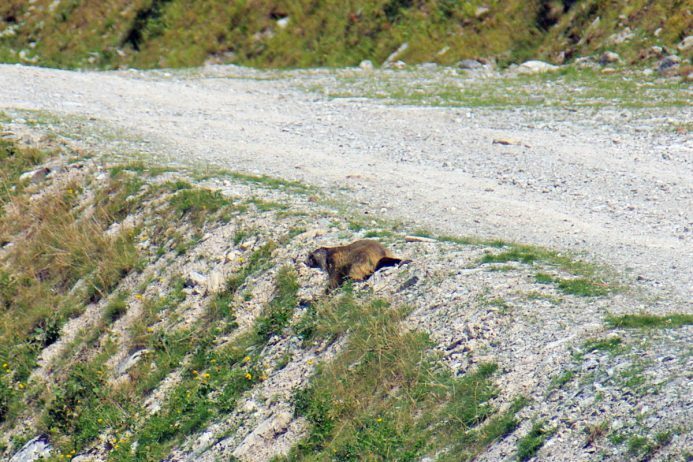 If you’re up for it (and don’t fear vertigo) you can walk up to the Aiguille Grive (2,732m). Take the Cachette chairlift from Arc 1600. 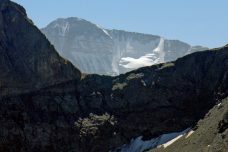 From the upper terminal at 2,160m take the trail to the left. It will lead you to two tall rocks: the Deux-Têtes (Two Heads). The view is amazing. 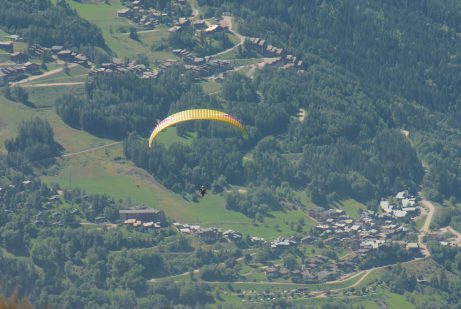 Below, the Tarentaise Valley and Bourg-Saint-Maurice. 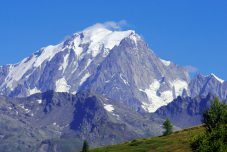 In front of you the Beaufortain mountains and the Mont Blanc. 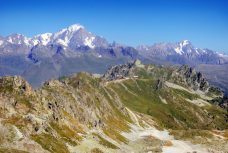 The Aiguille Rouge (3,227m/10,587ft) is the culminating point of the resort of Les Arcs. 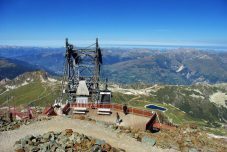 The ski lifts that open in Summer climb all the way to the top of the Aiguille Rouge. The view from there is absolutely breathtaking. 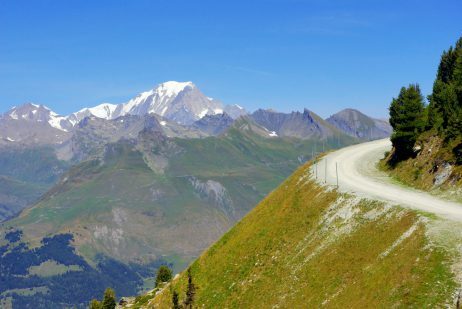 You can embrace the French, Swiss and Italian Alps. With favorable weather conditions we could see as far as the Jura mountains. 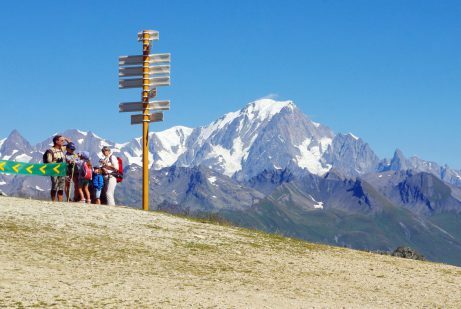 The Aiguille Rouge gives you the grandest panoramic view of the Mont Blanc massif. 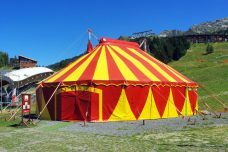 Find out more about the Aiguille Rouge. 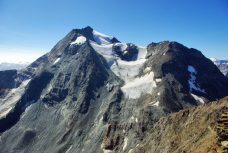 If you are hiking above 1,500m don’t forget to bring with you some warm clothes (jumper, scarf). Even in Summer, temperatures can be low particularly in the morning. 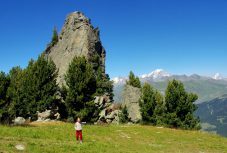 Check out the weather forecast of Les Arcs before heading to the heights. It is quite common for a storm to fill the sky by the end of the afternoon. 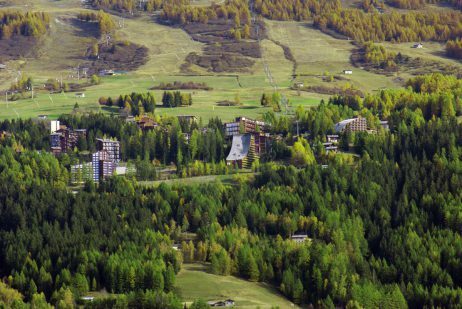 In that case ski-lifts will be closing… and you’ll have to walk down to the resort under the (heavy) rain! Take with you a pair of binoculars. Very handy when you explore the heights. Don’t forget your camera too or grab a good selfie with your smartphone! 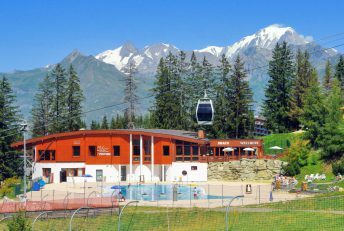 If you wish to explore the domain of Les Arcs, get a Day Pass at the funicular station in Bourg-Saint-Maurice. 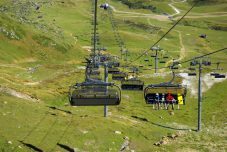 Choose the Day Pass that includes the Varet télécabine and the Aiguille Rouge cable-car (20 euros in Summer 2018). 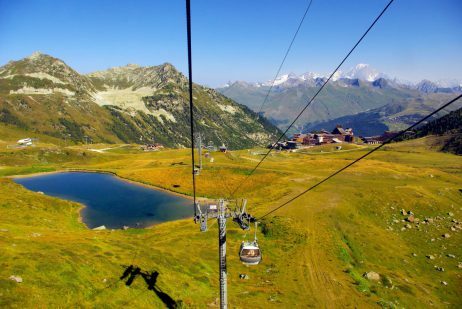 It will allow you to ride all the ski lifts open to pedestrians in Summer. 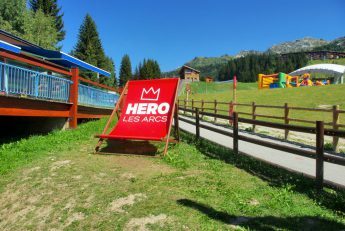 More info on Les Arcs in Summer) . 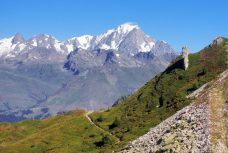 Next Article Why you should climb the Aiguille Rouge in Les Arcs!